One item of merchandise that many fans fondly remember are the audio story adventures, released on vinyl recordings between 1976 and 1978 by Peter Pan Records, usually under its subsidiary, Power Records. Power Records was a related label, featuring characters licensed from DC Comics and Marvel Comics, and contemporary television series (such as Space: 1999, Kojak, Star Trek and The Six Million Dollar Man), in stories aimed at older children. The book-and-record sets frequently featured original comic books along with an extended-play 7" record of the story. There were also other 7" single releases. Besides book-and-record sets, LPs were produced, featuring the recorded stories without illustrations. Peter Pan Records was a record label specialising in children's music. The label was introduced to the public in March 1948.The label was owned by the Synthetic Plastics Company of Newark, New Jersey until the 1970s. The label became one of the largest and most successful children's speciality record labels in America, manufacturing unique, quality releases that often contrasted with those of their competitors (Wonderland Records, Kid Stuff Records, Mr. Pickwick). Peter Pan enjoyed their greatest success as a children's label during the 1950s. The Six Million Dollar Man saw 2 12" 33.3rpm LPs released, comprising 4 adventures per disc, 2 stories a side. A third album was released comprising of shorter, Christmas-themed adventures. 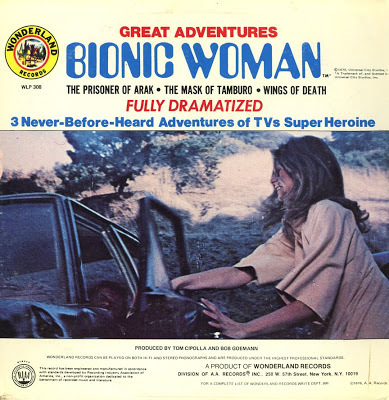 None of the adventures used any of the original actors, music or bionic sound effects from the shows, but did include full-casts, music, and voice-over narration. The average running time of the stories is around 10 minutes. The Christmas Adventures clocked in at around 8 minutes. The Christmas album was never released in any other format but vinyl, the other two volumes were later re-released on CD by Power Records — a label owned by the same parent company as Peter Pan, which produced material aimed principally at teenagers. 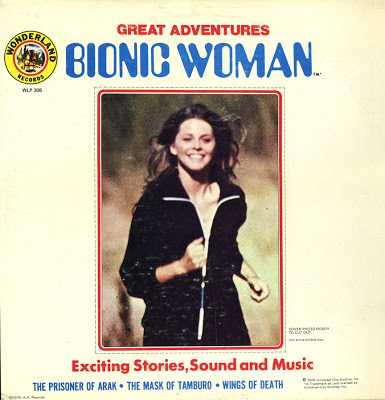 These were the only stories to star Steve Austin, however Wonderland Records, released a single album featuring Jaime Sommers in 1976: Great Adventures: Bionic Woman. 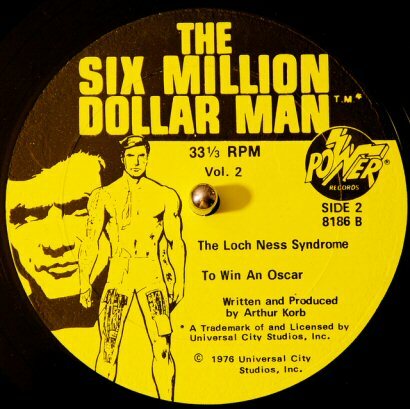 The first Six Million Dollar Man album was later released with a more TV-themed cover and features photo's from the show, although the content remained the same. There was also a smalelr 7" album released containing just 2 of the original volume 1 stories, Birth of the Bionic Man and The Man From The Future. This album also contained a full colour comic album - available here as a .pdf file. To listen to all the tracks from these albums, go to our audio media page here.